I am December's Common Thread Give-Away Artist. 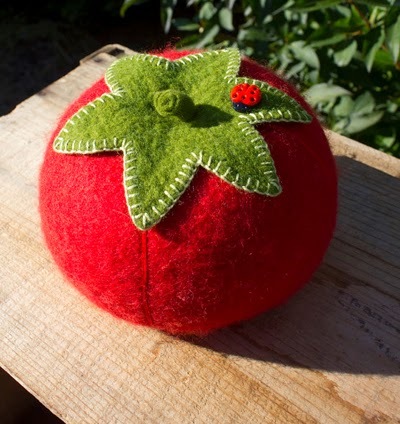 I will be giving away one of my over-sized red wool tomato pincushions. 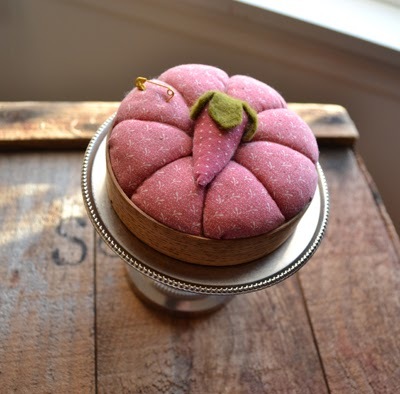 It is likely no mistake that I came to be a creator of pincushions, though I hadn't realized how this happened until I sat down to write about the pincushions I have received as gifts. This writing made me realize how near and dear these pincushion gifts were, along with the friendships that they represent. These relationships literally transformed my life. 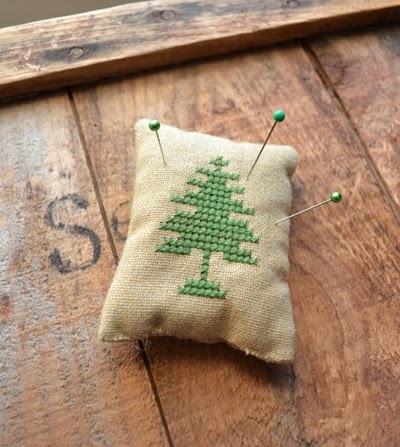 When I was young, I had an inexpensive pincushion from the dime store. Didn't we all...the small red tomato sorts with the little strawberry emery attached to sharpen our needles. It was added to my personal sewing notions that I needed in order to take the required basic Home Economics Sewing Class 101. 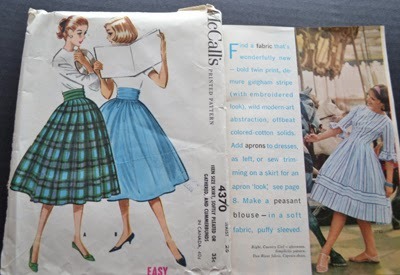 This was the class where everyone had to make a gathered skirt with a zipper on the side, a waist band at the top and a hand-stitched hem on the bottom. Though we all had at least one of these skirts, it was never my favorite and I avoided wearing it until it was the only item left in my closet clean to wear. I can still see the material and even have a piece of it in my crazy quilt. My mother made a cummerbund to wear with it, likely knowing that I needed an incentive to wear it. I laugh to think of the style. It was a good thing that I was a bit too young to have hips, as this would have been a skirt to turn them into holster hips to be sure! I was fortunate that my next project got to be whatever I wanted to make. I just had to go with my mom and purchase a pattern and material of my choice. I still have the pattern and the material was a red pillow ticking material. A picture is worth a thousand words and will date me. It is hard to believe that girls didn't wear pants to school and on cold days we wore jeans under our dresses? I hope you are laughing now to be sure...but it is all true!! I loved my Home Economic's teacher. Her name was Mrs. New. I even called her "Mom" on many occasions, a Freudian slip of the tongue. She was my "mom" at school. Soon I was getting out of study hall to get extra sewing time in her class. She talked of love and home values and was the comfort zone that I needed at school. Her favorite saying was, "This above all to thine own self be true and it must follow as the night the day, though then can'st be false to any man" (Wm Shakespeare). She was sewing my character as I sewed the seams of my red pillow ticking dress. Though to be sure, I did a lot of seam ripping in those days to correct the errors of my ways...and I am still doing lots of "virtual seam ripping" to correct my character flaws today! But back to the subject of pincushions.... I have been gifted eight pincushions in my life, including my first tomato pincushion. I didn't value the first one, as it was replaced with personal ones made specially for me. I am a soft touch for hand made gifts that required patience and love to create. This is the precious pincushion that Bertha made for me. The portrait that Bertha drew of me along with her special note. 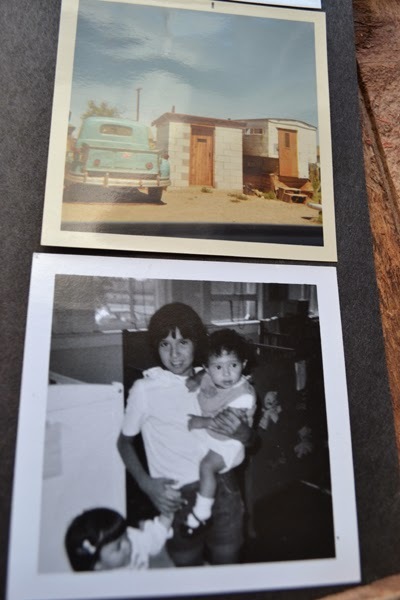 Above, living quarters for a migrant family. Below, Bertha. My second pincushion was made and given to me by a young migrant girl, Bertha Hernandez. 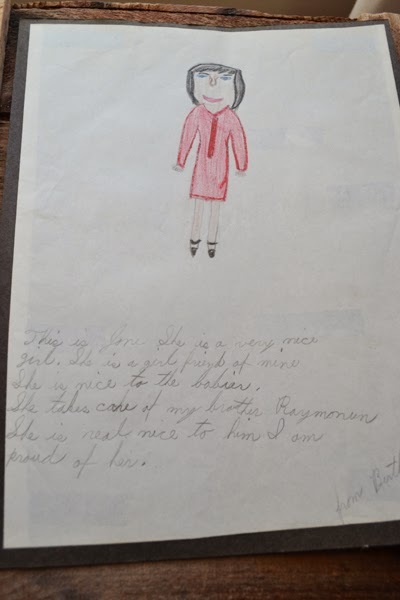 I even saved the letter and her hand drawn picture of me. I loved this young girl, her brother and her family, along with other migrant babies we had in our migrant nursery the summer break of my third year at college. 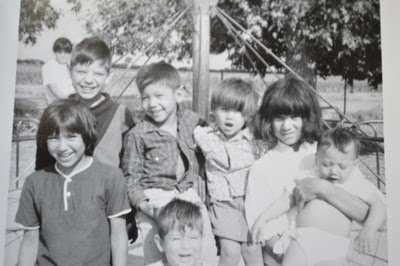 My job was to set up and run a day nursery for migrant children in southern Colorado. Bertha and her friend would come into our nursery class at the end of the day and join us as we rocked the babies and sang to them while we waited, for the school bus to come to take them to their temporary homes. We had them bathed and fed and snuggled, and perhaps Bertha felt like I felt in Mrs. New's sewing class. My classroom nursery was a home away from home for her, the migrant babies and me. A very special personal pincushion from Suzanne Clark. Just a tiny gift from a friend. Stuffed with pine needles and smells of pine. This beauty was made for me by Pam and Dennis Conrad. 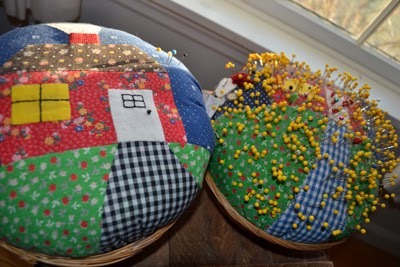 Twin appliqued basket pincushions by Pam Conrad for my mom and me. Later, special pincushions were made by my best friend, Pam Clark (now Conrad) and her sister, Suzanne. Both were very creative and each pincushion was different and special in their own ways. I have always had room to keep them! I cannot look or use them but what I think of all the good times that we shared together during and after college. I hadn't a clue then that they would be the heart and inspiration behind my Little House Home Arts business and that I would become known locally as The Pincushion Lady. Gift for myself from a quilt show. The bag for threads is invaluable! My latest pincushions were gifts to myself. It is important that you gift yourself just as you gift others. 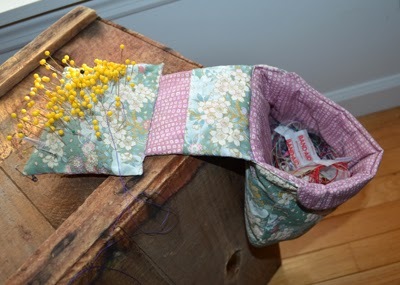 My scrap bag pincushion is one of my favorites and sits by my chair as I sew, catching all my little bits of threads. 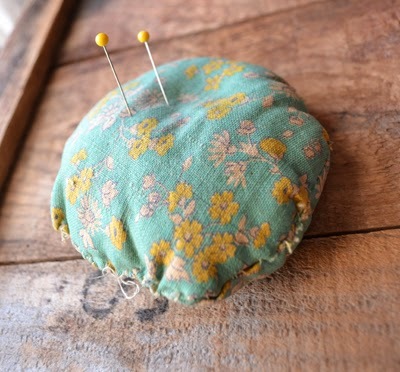 And my last pincushion is one that I made and loved so much that I had to keep it.It was designed after a hat-pin pincushion I found in an antique store. It has soda cans it it to form a foundation. I love crazy quilting and the hours put into this made it such that it would have been like selling my soul to have sold it afterwards. A very special crazy quilt hat-pin pincushion made by me. I couldn't sell it. Each pincushion I make is made with the love that was sewn into those that were made for me. It is funny how our lives are shaped and it isn't until we look back and see the patterns that we come to understand just how transforming and important these little personal gifts of love are to us. Pincushions now represent to me the love of home, family and friends. Stitched with love, they represent the way our friendships are made....with bits of time carefully sewn to create a bond of friendship that gives and receives, helping us to grow into the people we are to become, with character, and love that overflows to pass on to others. To win my special wool tomato pincushion, simply leave a comment, Monday, December 2nd, through Wednesday, December 4th. A drawing will be held and the winner announced on Thursday. If you don't win this pincushion, please know that there are many for sale in my Etsy Shop. If you prefer something other than a pincushion, you will find many other sweet gifts to share with your friends and family! EDIT: If anyone is struggling to post a comment, please feel free to email me at jmcvermont@comcast.net with your comment to be entered. To anyone who has commented but whose comment isn't showing up, It has been emailed to me but isn't appearing on my page - you TOO are entered! My mother always used a pincushion and it was a tomato with a little one attached to it as well. When I go home to the farm in Iowa, I go to the sewing room and think of Mom. She was a beautiful quilter and she did such beautiful work with her hands. I'd love to win your pincushion, to have my own and reminsce about my mom. Thank you. Julie L.
In 8th grade I had a strawberry pin cushion in sewing class. Its the same one I use today. I would be thrilled beyond words to have one made by you. Your work is beautiful! That was a walk down memory lane - that pin cushion reminds me of my grandma - there was always one nearby. I also LOVE the pincusion with the scrap bag. 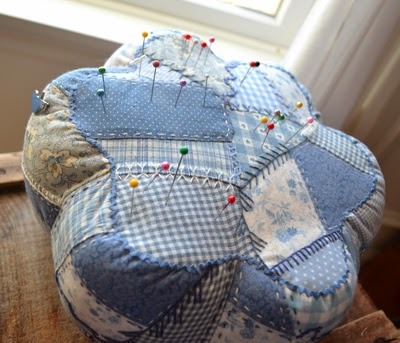 I could use a new pincushion for my quilting projects. Yours are really cute. You were obviously much more successful in home economics class than I was.. I can still see my green skirt but I had to make a matching blouse the following year. If I had owned one of your pincushions I would be a different person today. how lovely to read about your pin cushions! I am intrigued by the pine stuffed one and thought that one stuffed with rosemary would be very aromatic as well. After reading your experiences with gifted pincushions, I tried to remember if I was ever so lucky. And, yes, I received a flower pot pincushion made by a little friend. Very precious and treasured. I, too, like the lady bug resting on the tomato. My grandson's favorite bug. Reminds me of my first sewing class - under the 4H umbrella. The first project was a felt square pincushion. Don't remember the second, but several years later my sisters snd I graduated to Singer Summer Camp and we tackled sewing and patterns. I wasn't very good at it and hated sewing until I discovered quilting decades later. So glad I came back. .. I also have memory pincushions - one made from scraps of felt left from the felt applied to the walls of my office at the library. Would love to have a tomato pincusion. My favorite pin cushion was one I fit on my arm like a bracelet, oh how I loved it! Since moving, I cannot find it, so winning yours would be a wonderful change! My grandmother -- who didn't have much money, made me a pincushion out of the plastic cover from a spray can. It had stuffing in it and a cloth cover with a braided edge. It unfortunately has come undone so I could really use a new one. I would love a chance to have one of your pin cushions. Wonderful story, brought back many memories. Such a beautiful pin cushion. What a delight to have! The ladybug is just too cute! such a sweet pincushion. You folks in that area of the US are so wonderful and giving and crafty! I love the pin cushion and it would fit very well into my life. I would handle it with care. Thanks for the opportunity. Your pin cushion is lovely and reminds me of my mother's "tomato" pin cushion that was used when she taught me to sew. I still have it of course. Thanks for the opportunity to win one of your lovely handmade pincushions. I also enjoy your written words. Oh, I am so thrilled to have stumbled upon your blog! I never learned to sew growing up--my mother did and my grandmothers did, but only my paternal grandmother continued to sew in her older years. She learned tailoring when she was sent to a girl's boarding, "finishing" school around 1916. I suppose I did not show much interest in learning, but now I am obsessed with all forms of needlework. Please throw my hat in the ring! Everything that I see on the sites of you artists are so adorable. These pin cushions are really cute and bring up so many memories! I'm learning to knit, making fairy gardens and having alot of fun in my life! I start each day with Jon Katz' and Maria Wulf's blogs. Through them, I've been turned on to small artists and have joined the Plaid Friday movement. Thank you all. I love your pincushion stories, and the tomato pin cushion. I only have one, handmade by my mom, and it has seen hard use and gotten quite discolored. I'd love a spanking new one! I too have similar memories of 8th grade Home Ec and the stupendously ugly print skirt that I was forced to make and had to wear at least once for a passing grade. Oh, and the matching triangle scarf. I now love to sew in spite of it all and would love to win the wonderful pin cushion! I enjoyed your post. Your pincushions are gorgeous. Thank you for the opportunity to win one! beautiful pincushion, beautiful art. Would love to win this. What fun to walk down memory lane with you! Sewing is a thread :) that connects so many of us together. 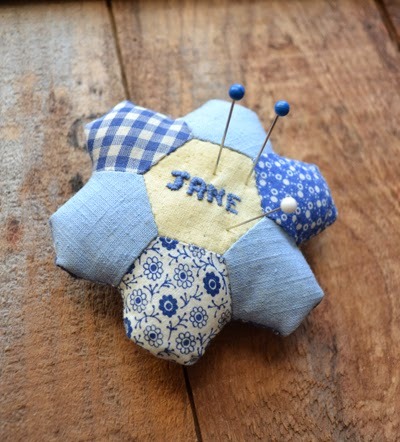 Even for those of us with health issues that prevent getting together with sewing friends, we are blessed by the joys of seeing what others create on blogs like yours, Jane! I liked reading your home ec story. I was not good at sewing in high school. I actually had my grandmother sew the blouse and skirt for me. I snuck my material out out most days in my book bag. how I talked her into that I do not know. I must have been quite pathetic. As I grew older I got much better sewing my children's Halloween costumes each year, plus years of making kitchen curtains. I would love to win your pin cushion. I would be honored to win it. Thank you. Hi Jane! I do so enjoy reading your blog and appreciate and admire your creations even more. I would be so honored to win this beautiful pin cushion. And your blog brought back so many different memories for me of sewing class in high school and watching my grandma sew when I was a little girl. I always felt so special in the outfits she made me as I knew it was the only one like it. Thanks for being a part of the give away! -- Vicki B.
I too value handmade gifts more than bought ones especially if they are made by my children, grandchildren, or husband. My Dad was pretty good about making things too as he was a woodworker. So, love your pincushion and sure wouldn't mind having it. Thanks for doing a give-away. I am the very happy recipient of your beautiful tomato pin cushion via my friend Emmett who won it from you and gave it to me as a gift! I have been admiring his for ages and am so happy to have one for myself. It is just perfect, thank you so much! Wishing You a 2014 Filled with Hope!